Empathy has suddenly become, in the commentarial argot, problematic. With the Trump victory leaving many liberal Americans reeling, appeals to “empathize” with voters who elected him can ring hollow. Does not empathizing with them play into a process of “normalizing” a toxic leader, and help mainstream an unacceptable ideology? Is it not cruel to ask some Americans to put themselves in the shoes of groups of people who are fundamentally prejudiced against them? 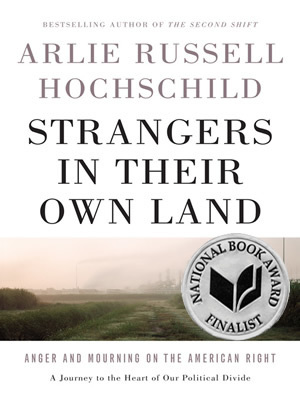 Against this backdrop, Arlie Russell Hochschild’s Strangers in Their Own Land: Anger and Mourning on the American Right, published by The New Press shortly before the election, is more relevant than ever. The book is a nuanced yet readable portrait of a segment of America whose support for the Tea Party, and then for Trump, has been instrumental in bringing about our current situation. It is also a challenging meditation on the politics of empathy more broadly, frustrating and challenging precisely at the points where the reality it depicts is frustrating too. Hochschild is a distinguished sociologist, now emeritus of the University of California Berkeley. Strangers in Their Own Land is the product of five years of extensive interviews and on-site research in Louisiana bayou communities. Hochschild embeds herself among Tea Party diehards from a variety of backgrounds, attending political rallies and crawfish boils, touring homes and industrial parks, gathering stories of economic hardship, environmental destruction, and political conviction as she goes. The organizing frame is an explicit reprise of Thomas Franks’ 2004 What’s the Matter With Kansas, namely an investigation of why blue-collar conservatives support a political order that is manifestly indifferent to their material interests. With its extreme poverty, broken education system, low life expectancy, and terminally underfunded public infrastructure, Louisiana ranks 49th on the American Human Development Index, and thus serves the purposes of Hochschild’s inquiry well. Louisiana also presents an additional riddle, as for all the Red State’s governing rhetoric of rejecting handouts, it depends heavily on Federal aid, which amounts to greater than 40% of the State budget. This seeming contradiction, a “need for help and a principled refusal of it,” is what Hochschild labels “The Great Paradox,” and it drives her focus on a specific touchstone issue – the environment. Here again Hochschild has picked a stark example. 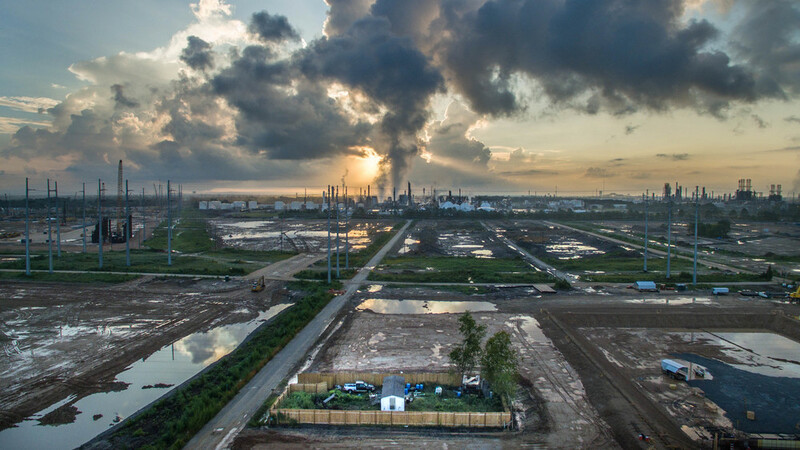 The towns she visits are at the heart of a massive “petrochemical empire” of oil refineries and chemical plants, places where the bayou has turned toxic from mishaps and illegal dumping. The stories are heartbreaking and nightmarish. Sinkholes produced by drilling swallow entire homes; wildlife die horribly from pollution; more. In one extended Cajun family Hochschild profiles, every single member has been afflicted by devastating cancers; another interviewee tells a story of how her horse was exposed to industrial waste, had its skin become “rubberized,” and died in agony. And yet these people almost exclusively reject the prospect of Federal environmental regulation as anathema, and vote for politicians who favor deregulation and who pillage social services to incentivize yet more industrial development. “How can a system both create pain and deflect blame for that pain?,” Hochschild asks. 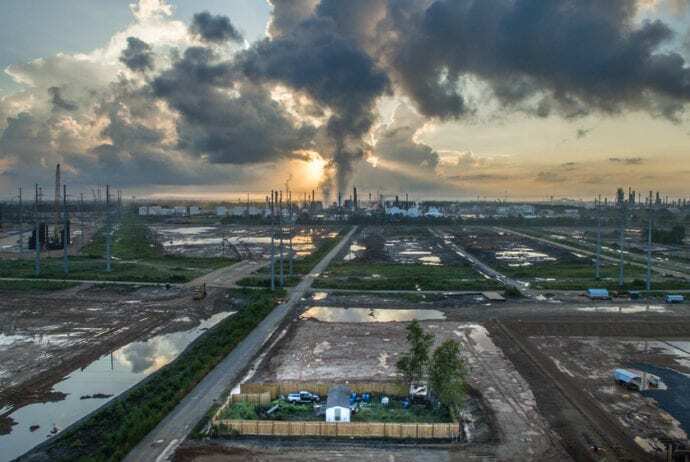 Equally important, religion offers Hochschild’s interviewees a frame for processing the hardships of economic life on the one hand and environmental devastation on the other. Their Christianity shapes how they “recognize blessings” (i.e., steady employment, industrial development) and recuperates their earthly suffering. “Their faith had guided them through a painful loss of family, friends, neighbors, frogs, turtles, and trees,” Hochschild writes of one family. “They felt God had blessed them with this courage to face their ordeals, and they thanked Him for that.” Many readers may perceive in this, if not an illustration of Marx’s attitudes toward religion-as-opiate per se, at least another kind of tragedy. Indeed, some of Hochschild’s subjects bear suffering while looking forward to the Rapture, and view environmental destruction through an eschatological lens: “But if we get our souls saved, we go to Heaven, and Heaven is for eternity…We’ll never have to worry about the environment from then on.” In this instance and more broadly, Hochschild sees religion as supplanting and precluding political mobilization. “Word from the Lake Charles pulpits seemed to focus more on a person’s moral strength to endure than on the will to change the circumstances that called on that strength,” she writes. “In their tough secular lives, life [for these Louisianans] may well feel like “end times.” But word from the pulpit also seems to turn concern away from social problems in Louisiana—poverty, poor schools, pollution-related illness— away from government help, and away from the Great Paradox.” “They say there are beautiful trees in heaven,” one Louisianan, who has spent a lifetime watching his beloved bayou die around him, tells Hochschild. The tension between this desire for material advancement and restored dignity on the one hand and a rejection of the victimization rhetoric of “poor-me’s” on the other finds, Hochschild argues, its logical expression in rhetoric and affects of the Tea Party. When Hochschild proposes this “Deep Story” to her interviewees, they endorse it heartily. And it is indeed resonant as a kind of key for understanding both the Great Paradox and so much of contemporary working conservative politics. But it also raises issues. The feels-as-if dimension and emphasis on narratives of (restoring) self-esteem leaves little room for acknowledging histories and other people Hochschild’s subjects would rather not contemplate. Race in particular becomes troublingly peripheral; as Hochschild notes, “Missing from the image of blacks in most of the minds of those I came to know was a man or woman standing patiently in line next to them waiting for a well-deserved reward.” This signal absence of empathetic imagination on the part of her interview subjects is thrown in ever sharper relief given how Hochschild’s own inquiry is itself presented as a kind of exercise in empathy, an effort to think beyond a liberal “empathy wall.” “An empathy wall,” Hochschild writes, “Is an obstacle to deep understanding of another person, one that can make us feel indifferent or even hostile to those who hold different beliefs or whose childhood is rooted in different circumstances.” But if Hochschild is admirably willing to break down or scale an empathy wall when it comes to her conservative subjects, there is little signal that they are willing to do much of the same for others, and for minorities in particular. And this is where things fold back on themselves in a frustrating way. The injunction to understand the emotional plight of immiserated Conservatives, for all its merits, does not guarantee any reciprocal emotional movement from them. In fact, it feels rather like just another “feeling rule” — this time, enjoined by liberals upon themselves. And like so many feeling rules, it flirts with erasing or eliding some feelings in favor of others. In a closing section of Strangers in Their Own Land, Hochschild attends a rally for Donald Trump, whom many of her interviewees support, and astutely paints him a candidate of and for feelings (or rather, of and for a particular set of them). Trump may not represent the material best interests of these Louisianans, but he embodies their “emotional self-interest.” Hochschild invokes Durkheim’s notion of collective effervescence to cast the Trump phenomenon as offering her subjects a delirious “high,” a glimpse at recapturing a sense of self-worth amidst abjection. But this seems, to me at least, to understate another key affect at play in Trump events, and in Trump’s broader appeal: rage. What her subjects want, Hochschild repeatedly says, and what they apparently see in Trump, is an opportunity for “vindication.” But “vindication” means something more than just “recognition” or “being seen.” Etymologically, “vindication” derives from a word for vengeance, and, ultimately, the assertion of authority through force. In America, such appeals to emotional revanchism, even when nominally colorblind, have never been neutral, and have fueled centuries of both structural oppression and extrajudicial violence (as documented brilliantly in Carol Anderson’s magisterial White Rage). However unpleasant it may feel, acknowledging a desire for restored dignity on the part of marginalized whites is likely vital if the nation is to move forward – but the task of severing that demand from an all-too-proven history of racial and other persecution is an absolute moral imperative. And it is an imperative now more so than ever. Not just because, as Hochschild notes, liberals need to overcome their own hypocritical complicity in “an industrial system, the fruits of which [they enjoy] from a distance in their highly regulated and cleaner blue states.” And not just because, with Trump, we now face four years of the Great Paradox writ nationwide. But because, as Hochschild documents, if the tragic politics of her Louisiana subjects derive from mourning a loss of status and a collective “structural amnesia” of their suffering, these are conditions that, going forward, will hardly be restricted to poor enclaves in the South or the Gulf of Mexico. The writing is on the wall: environmental collapse and automation threaten the livelihoods, dignity, and survival of more Americans than ever before, and if we forget or write off such suffering, toxic politicians will pick up the slack and disaster will follow. In yet one more paradox, the Trump election now appears to have left many liberal Americans feeling exactly how Hochschild paints her conservative subjects: wondering whether “sympathy” for various marginalized classes is worth the bother, or if it’s instead just an insult, a demand for yet more emotional expenditure when every reasonable instinct calls for a contraction of empathy instead. Such demands for sympathy and understanding may indeed feel supererogatory, even cruel, and in of and of themselves will amount to nothing (or worse) if not coupled with political action and a staunch refusal to tolerate intolerance in the guise of recognition or acceptance. But such is the moment we live in, where an exertion of superhuman effort to reckon with the all-too-human may be the only way any of us can survive.